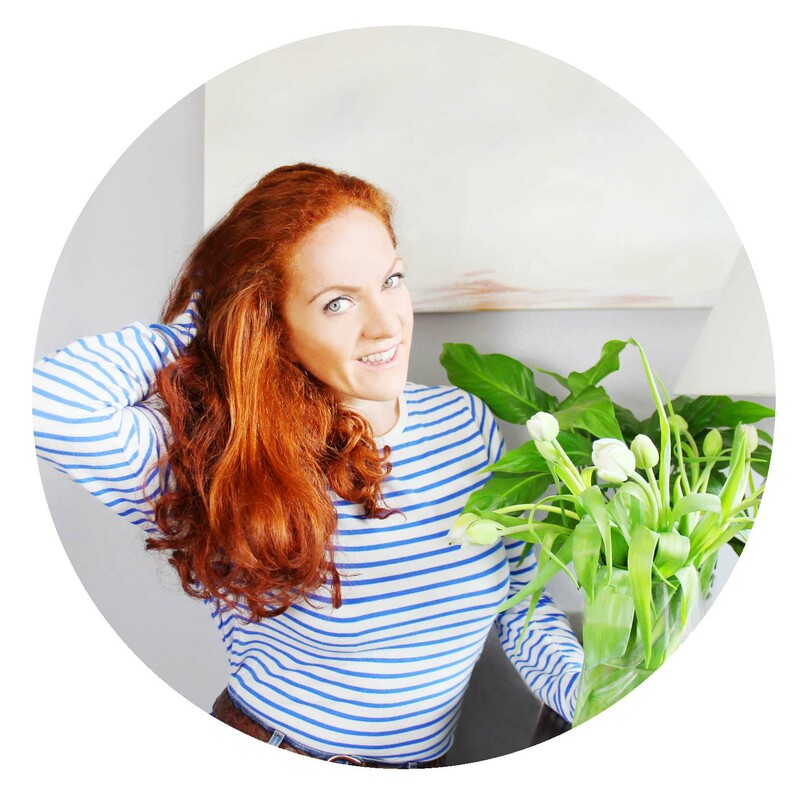 Mother’s day here in the UK is rapidly approaching (March 31st, incase you’ve forgotten) I thought I’d share a little Mother’s Day Gift Guide for any of you looking to buy something a little special for your Mum. 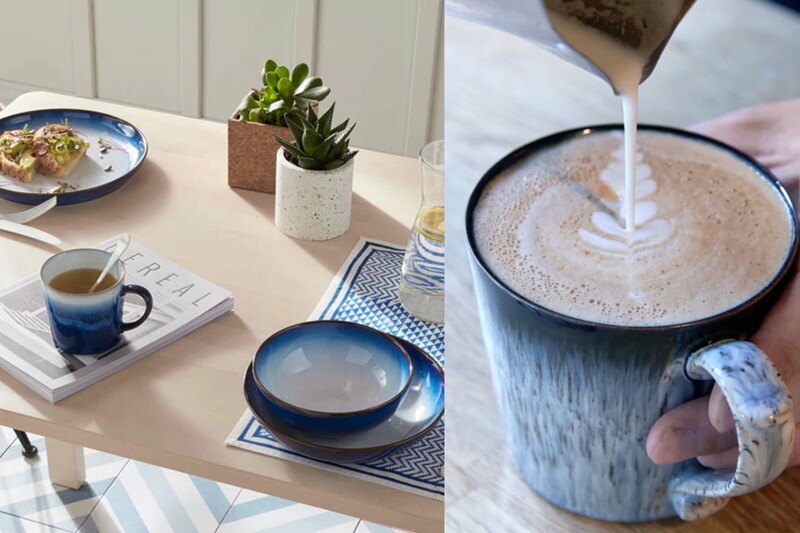 Something for the Kitchen: If you’re looking for something with a story made to last then the range at Denby Pottery might be a great gift for your dearest Mother. Denby Pottery was first founded in 1806 in Derbyshire. Production of salt-glazed pottery started at Denby in 1809 from a number of small buildings on the site of a just-discovered clay bed and the rest as they say is history! Today Denby Pottery still boasts the craftsmanship and quality that has stood the test of time. 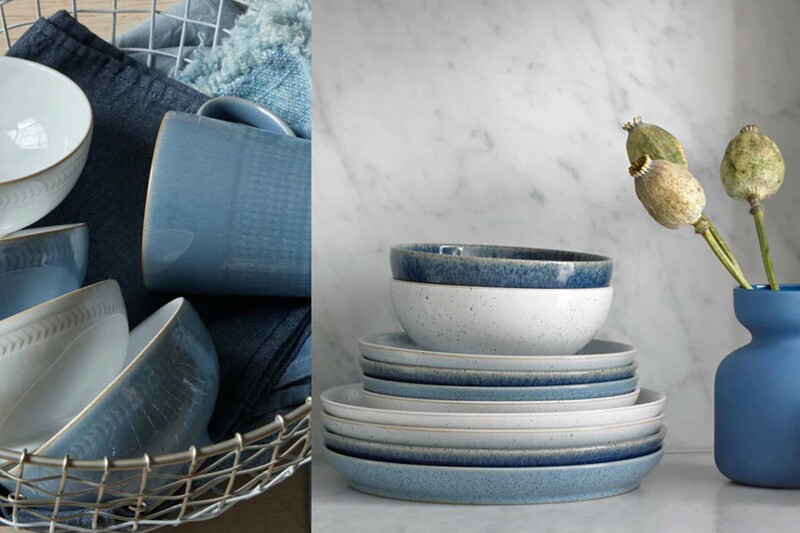 You can’t beat a range of quality stoneware! Say it with flowers: What could be lovelier than receiving a suprise bunch of flowers through the post? 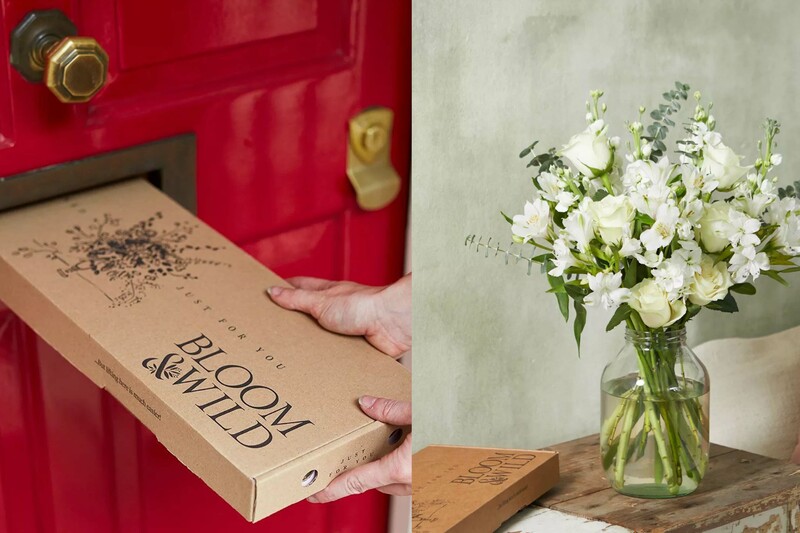 Bloom & Wild Flowers come in neat packages with individual flower stems that can be slipped through the letter box. Fabulous fragrance: The Neom Wellbeing Pod from John Lewis has been designed to deliver the perfect amount of fabulous essential oil scent in minutes with the power to fragrance your home and help improve your wellbeing. 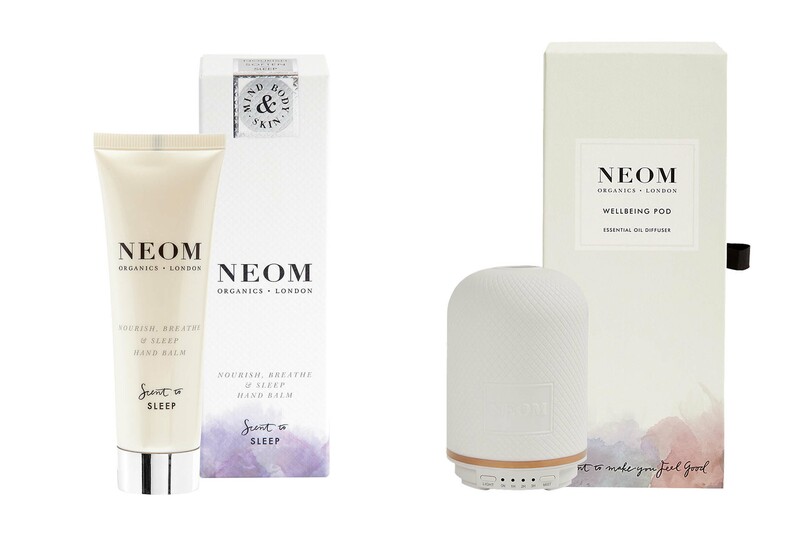 If your Mum loves beautiful smelling fragrances, the Neom Wellbeing Pod not only smells lovely but will help with better sleep, reduce stress, lift mood or boost energy levels through the use of 100% natural essential oil blends. Worth knowing: The pod does not come with any oils. The diffuser oils for use with this pod are sold separately. The Neom Range is totally divine and smells great, so worth checking out. I know this time of year can be hard for some of you reading and would just like to extend my love and thoughts to you. For any of you that are new mums, I hope that you’re spoilt rotten this year (and get a lie-in)! 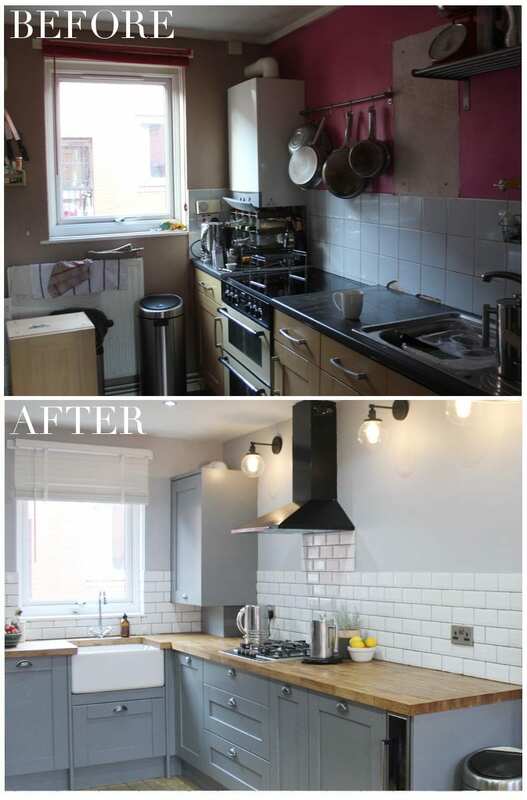 If you’ve been following over on Instagram you’ll have enjoyed several insta-stories of Mr T & I ripping walls down, removing tiles, grouting and all kinds of home renovation chaos. The last couple of months have been a journey of highs and lows, late nights, long weekends and lots of trips to the tip. 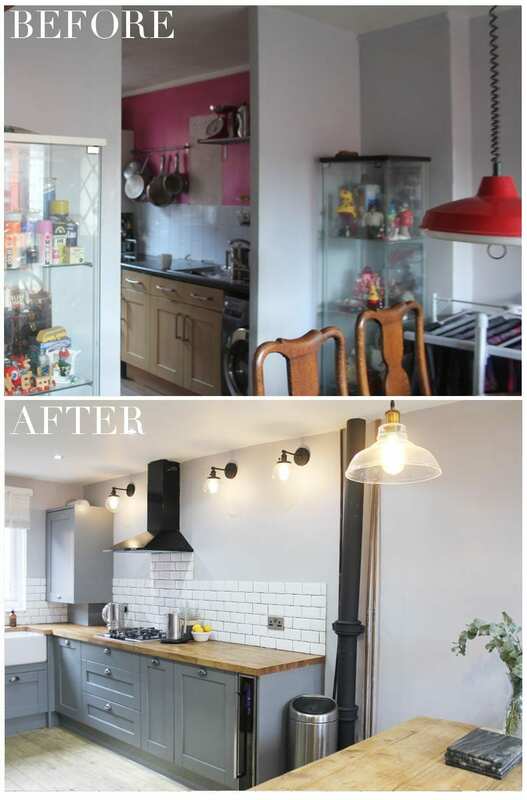 I’m so delighted to finally be able to share our kitchen renovation reveal! 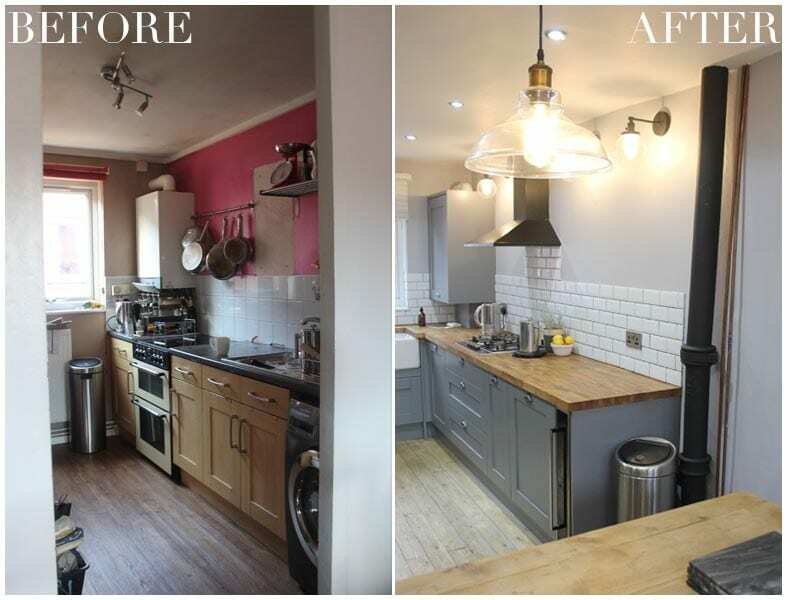 The old kitchen was dark, gloomy, run down and completely impractical. There was little storage, a huge cupboard that took up a lot of the room, but had no shelves inside of it. There were two walls dividing the kitchen from the dining area, which just added to the darkness in the room. There was only one plug socket that worked, hardly any useable worktop and just one ceiling light. I’ll do my best to describe how we went about the renovation linking to the products where possible. 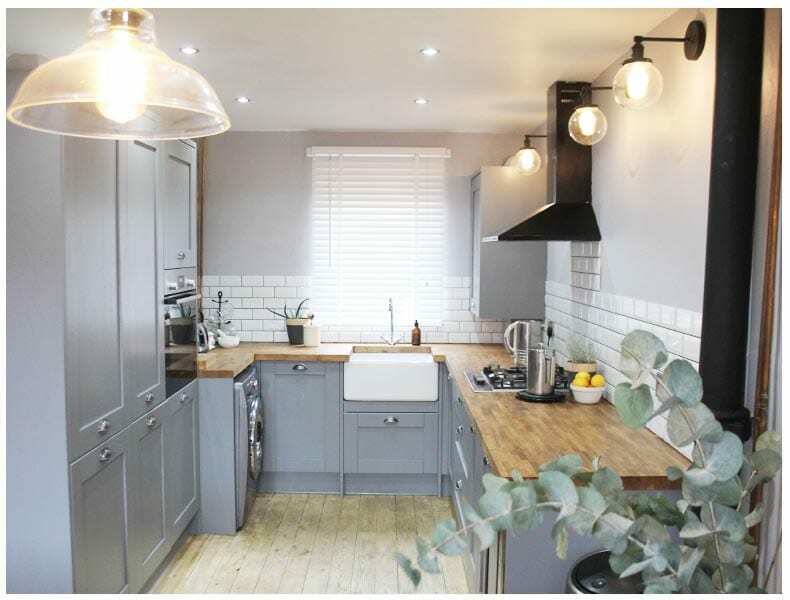 Dreaming: We started Project Kitchen by looking at dreamy kitchens online, using Pinterest to research kitchens we liked the look of, you can see my Shaker Kitchen Obsession post and my early Kitchen Interior Inspiration post. I feel like we actually managed to incorporate all the elements that we loved, which is pretty amazing. Planning: I have a notebook full of scribbles and measurements from trying to figure out the best layout for the kitchen. We don’t have much space as we live in the city centre, so wanted to make sure that we made the most of the space available. Once we had a vague idea of the style of kitchen we liked and the dimensions of the room, we visited several kitchen showrooms. 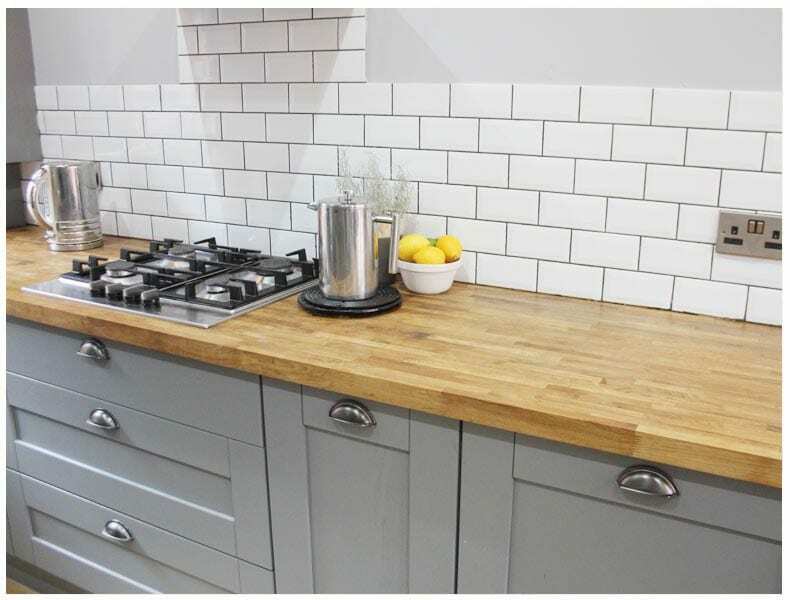 Visiting the kitchen showrooms was invaluable as there are so many space saving options available, such as integrated units that will really maximise storage, functionality and space. Most reputable kitchen companies will send out a sales person to take accurate measurements, create a CAD Design and get a quote together, so this process can take a little time. 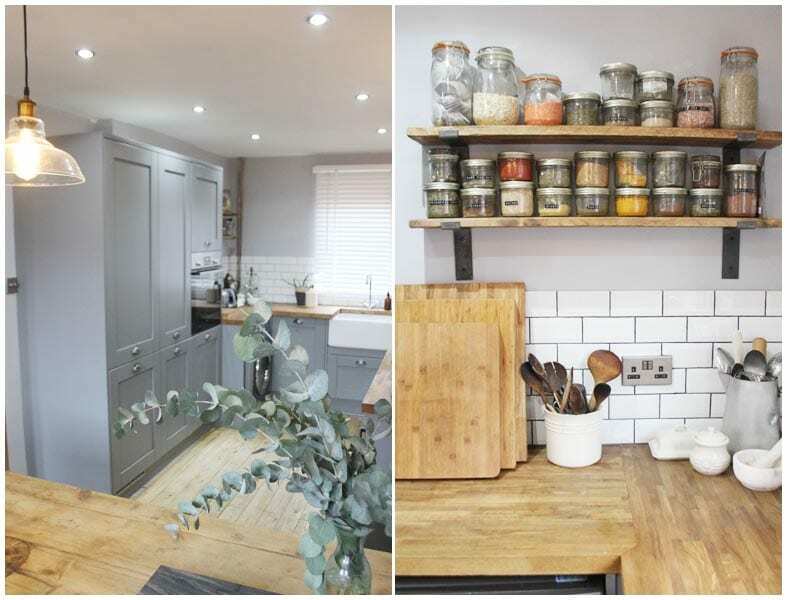 Choosing the kitchen: We got three quotes and opted for the Howdens Tewksbury Shaker Style Range as we always knew we wanted a solid wood kitchen. 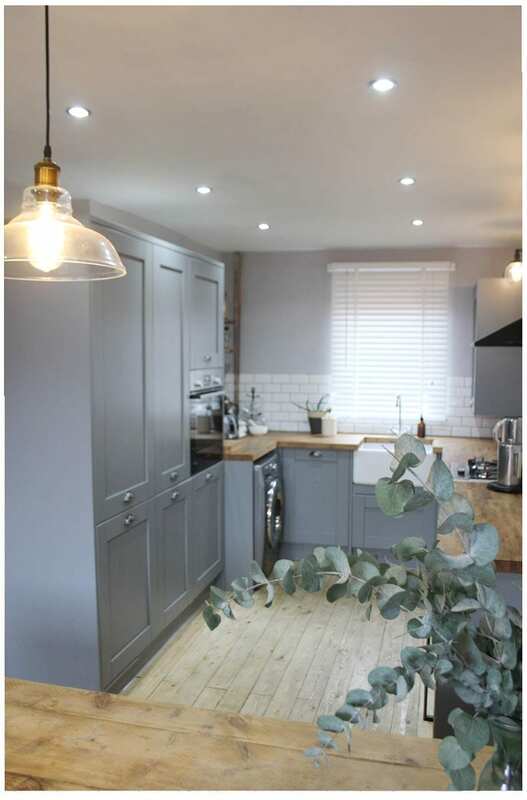 We love the sturdy feel of real wood and like the fact that we can repaint the units if we get tired of grey or need to retouch the paint for any reason. We found Howdens to be very reasonable in price and they were lovely to work with during the planning stage. We agreed on a layout and the style of units we wanted. 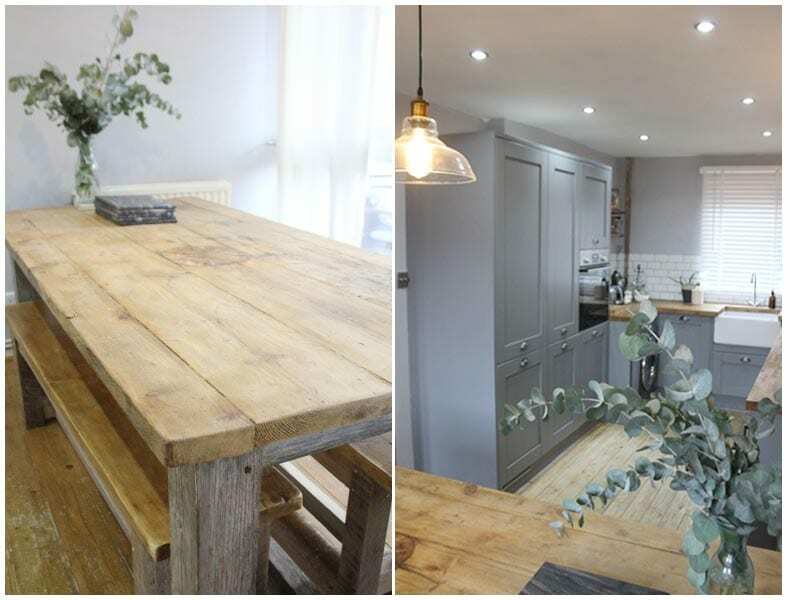 We went back and forth trying to decide on the oak worktop or to go for a granite, in the end we decided on wood, simply for the look and feel. Mr T has treated the oak worktop with oil, so fingers crossed we can keep it looking nice! Tip* For the few weeks when we literally had nothing in the kitchen but four walls- our saving grace was the Crock Pot, which we could just plug in and make a decent healthy meal. If you’re thinking about renovating your own kitchen, I’d recommend budgeting for dining out or invest in a Crock Pot, just incase! The floor: Our old kitchen had crusty old vinyl flooring which needed to be removed asap. We hit several hurdles during this renovation. the kitchen vinyl flooring had been glued down with something pretty impossible to remove. Mr T persisted and removed the vinyl flooring, we then put down a layer of self levelling screed onto the bare concrete floor. Once the screed had set and the floor was level we put down wooden floorboards to match the living room area. We used Tongue and groove floorboards and a Polyurethane Floor Varnish. Fitting the kitchen: We had several quotes from independent tradesmen and decided on a guy that had been recommended to use by our friends. Once Mr T and I had done the rip out and flooring we were so relieved to hand the baton over to our tradesman to get on with the fitting. Our tradesman tackled the faulty electrics (we now have x6 fully functioning plug sockets! ), the plastering and fitted the kitchen. 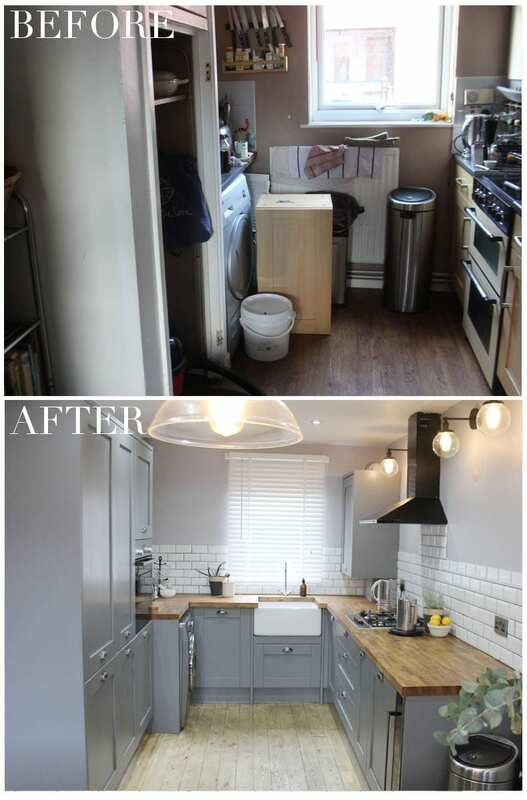 We unearthed lots of frustrating quirks along the way, like a dodgy hole in the crumbling ceiling from a previous water leak, a weirdly positioned gas metre, the electrics, things that you don’t see but that eat into the budget and take time to overcome! The kitchen fitting took around three weeks taking into account the hidden nasties and it was then up to Mr T and I to finish off. We did the grouting, varnishing, painting, shelving and the finishing touches. 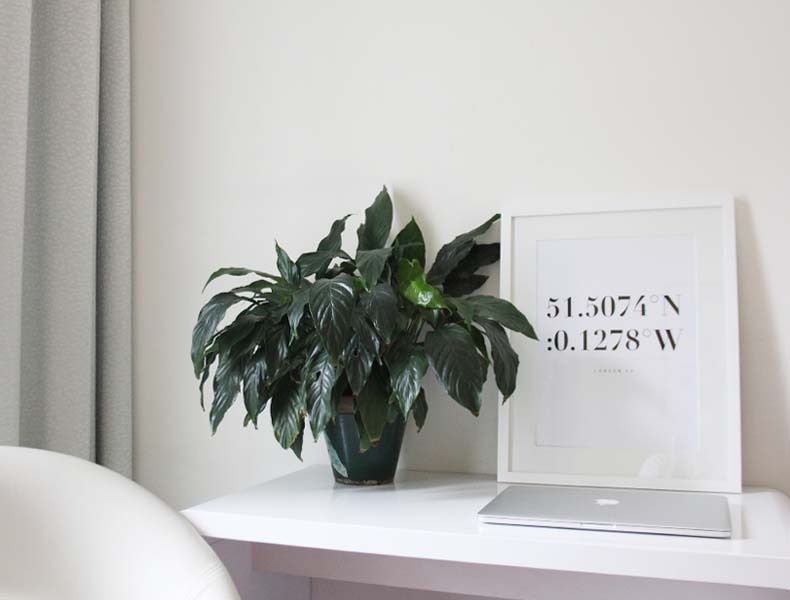 Inspiring Magazines: I always love to keep my favourite magazines around me in my home office. The photography and articles inspire me, I love to flick through the pages of publications like Conde Nast Traveler to inspire my own travels. Other magazines I love to have around are wellness publications like Calm Moment Magazine and Breathe Magazine. 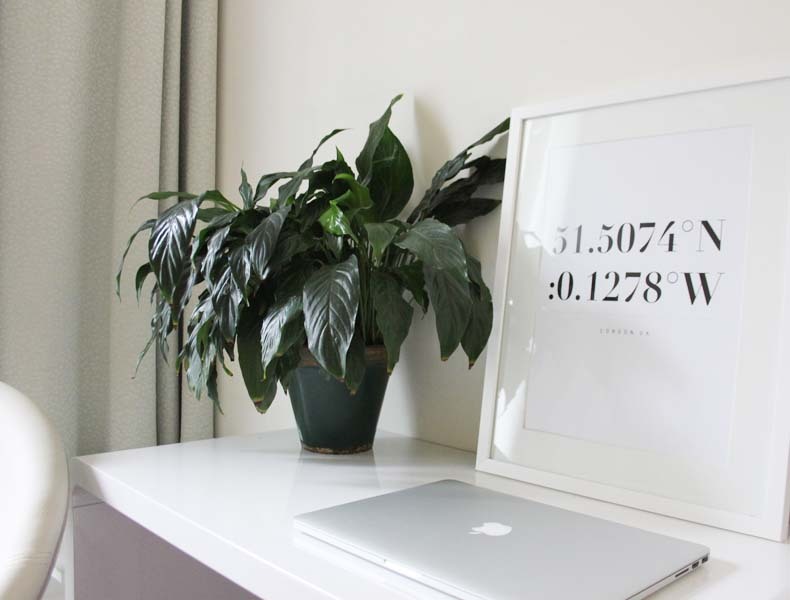 House plants: No calm home office space would be complete without at least one house plant. Being surrounded by nature is very calming and of course looks beautiful. A Peace Lilly is always lovely to have around, particularly when it flowers! 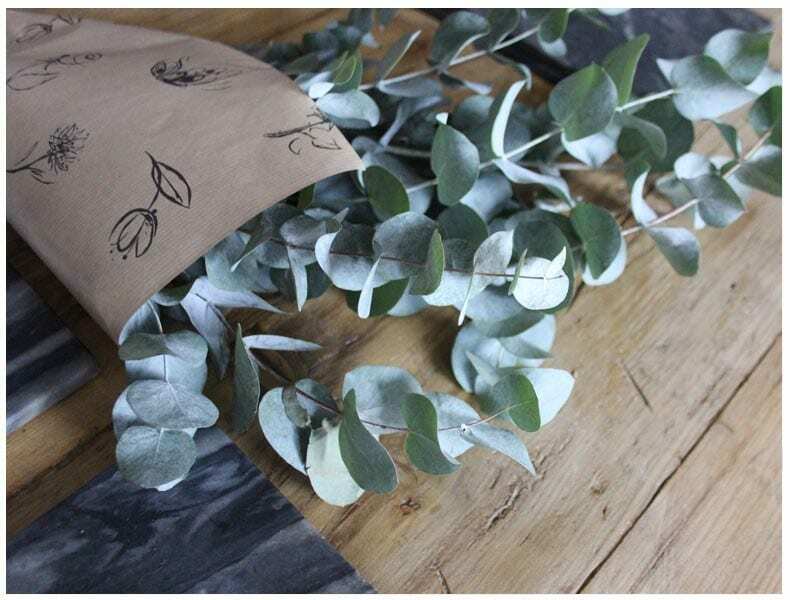 There are lots of great choices of house plants that will detoxify the air in your home. You can find out more details of detoxifying house plants in this article in Country Living Magazine. Quotes+ Affirmations: I love to read inspirational quotes and affirmations. 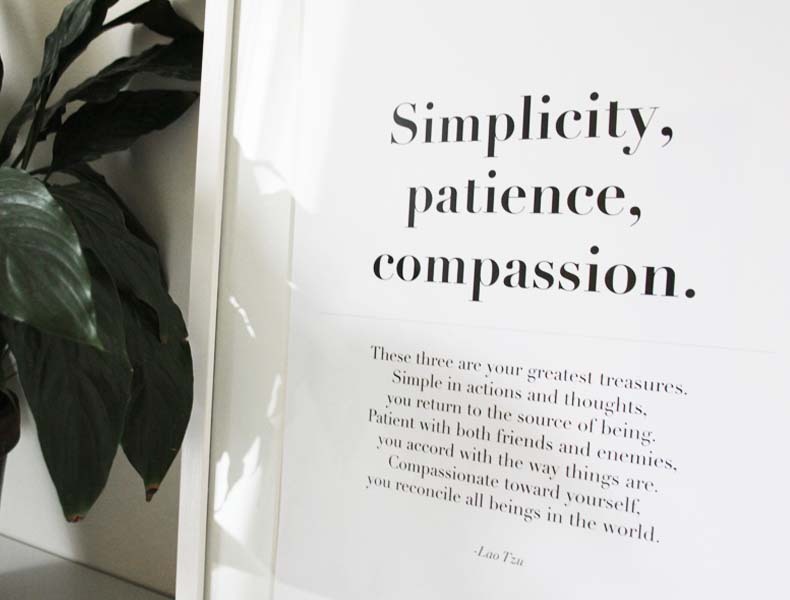 Having a few well placed quotes and affirmations around your home office can offer a little motivation and inspire a moment of calm when you’re day is getting stressful. Inspirational prints: It’s great to have inspirational prints around your office walls. 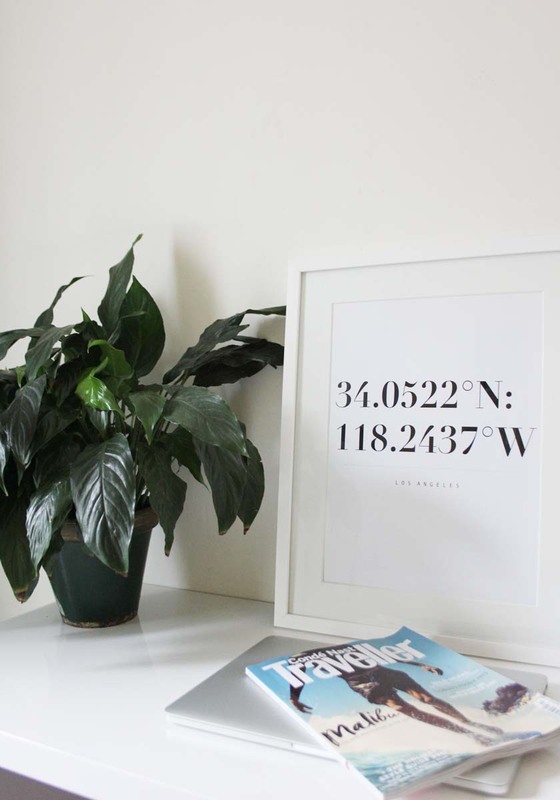 I have a few travel prints over on my Etsy Shop that have the longitude and latitude coordinates of some of my favourite places. Placing inspirational prints on your walls will help to calm you down and cheer you up when you most need it.